I was plunged into the mental health world when my son was 7 and made his first suicide attempt. I got him help, of course, but I needed to understand what was happening to him and to our family. Overnight, I became a mental health researcher and devoured any and all stories I could find about mental illness. I depended on the integrity and truthfulness of good reporting. I also developed a pretty good hogwash detector. I’ve discovered lately that I need all those skills and more. Stories and accusations about fake news crop up everywhere you look. 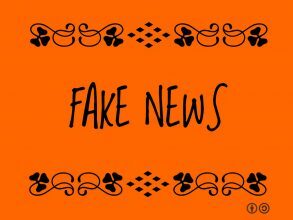 According to the Mirriam-Webster dictionary, the word “fake” is in the top 30% of words looked up and means not true or real. When it’s applied to a news story or new information, it’s intended to disparage the reporter, the sources or the content. I can tell you from personal experience, however, that just because the truth or information is hard to handle, doesn’t mean it’s fake. Fake news and information rely on the vulnerability of the person hearing or reading it to gain traction. Believe me, I’ve been there. When my young son would have a meltdown and then weep afterward that he was bad, I wanted to believe it was temporary, didn’t need serious treatment or was just a phase. Sure, he was out of control. Yes, he sometimes hurt himself. But he felt remorse, so didn’t that count for something? When therapists and teachers told me not to worry, part of me wanted to stop looking for the tough answers. I was tired and overwhelmed. I didn’t want to hear anything that was hard to handle. Media outlets, whether they are mainstream, lean to the right or left, often report stories differently. They don’t agree on the focus. Just like the media, different parts of the children’s mental health system never seem to agree. One professional will offer a different prognosis for your child than the next one. Another one will come up with a completely new diagnosis, when you’ve already got three. Like many parents, I heard wildly different recommendations from the psychiatrist, the teacher and the therapist. The psychiatrist (who turned out to be right) thought my son had a pretty serious mood disorder. The teacher thought my divorce, our move and change of schools were to blame. The therapist didn’t want me to be alarmed since children often grow out of their problems. They couldn’t be all right, could they? I had to learn to listen with both my head and my heart. I needed to face the difficult facts and also feel the compassion being offered to me. I learned that people have different training and biases and are often blind to the fact that they could be misleading you. Sometimes it’s not intentional. Sometimes it feels like it is. I am a pretty good critical thinker and know how to wade through information. But I didn’t listen to myself. Instead, I did trust him and that medication was a disaster once again. My son ended up in psychiatric crisis. Dr. G was likeable, charming and smart. He was confident that he was a good doctor and overall I think he was. But I had a very complicated son, whose medication reactions were unusual and extreme. What Dr. G told me – that my son was going to do well and be a different child – was wrong. I trusted his information because he was the one saying it, not because it was true. I relied on how much I liked Dr. G. I confused the speaker with the speech and forgot I was an expert too. After that, my hogwash detector got louder and less forgiving. Between my hogwash detector, wisdom gained from advocating for my own child and later, other families, I’ve learned some key points. Those things are turning out to be pretty useful when confronted by fake news. Don’t confuse how you feel about the source with the story being told. Just like Dr. G, many people are wonderfully persuasive and you want to believe them. I’ve had several friends tell me news items that I half believed because I liked them, later checking the items out and seeing they weren’t real after all. We all know who has rigorously checked something out and who isn’t so careful. How you feel about someone cannot substitute for carefully vetting the information. Watch out if the information or news is focused on attacking someone. Reliable sources report the facts, which are different from opinions. I have been disparaged and disrespected as a parent more times than I can count. Not because I was wrong but because emotions were high or bias against parents was in play. Good information and real news is about what is happening in front of us and not about personality. Did I mention that someone attacking me or another parent has ramped up my hogwash detector? Beware of polarizing tactics. I found out early on that different parts of the children’s mental health system often don’t agree. There is a lot of finger pointing by schools, by hospitals, by clinics and others. No one wants to be accountable. When polarization is at its worst, nothing productive happens. Children and families don’t get what they need. It’s the same in a polarized news environment. We agree on very little and very little gets done. There were times when the news about my son’s illness was awful and I confess I said to myself, “I just don’t believe this.” I wanted to believe the less troubling stuff and ignore the rest. Sometimes I did, but mostly I learned that the truth helps me make better choices. I learned to value integrity and good reporting. These days, it goes far beyond the mental health world. These are lessons we can all use and many need in these challenging times. Outstanding advice for parents of children in any system! Thank you, Lisa! Great blog. A big part of hogwash detection lies in understanding the bias that the speaker has (we all have biases). If you know that, then you have a bit of an idea about why they are saying something. A good mental tool is asking ‘why’. Why do you feel that’s the right medicine / diagnosis / plan of action? As parents we sometimes forget that we can and should ask why.